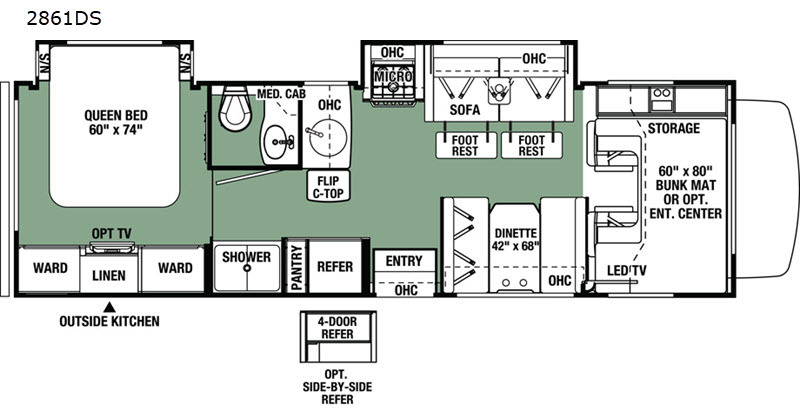 This double slide Forester 2861DS from Forest River features a spacious private rear bedroom. Inside the bedroom, the slide out features a queen size bed with nightstands. Across from the bed there are two wardrobes with linen storage between them for storing all of your things. 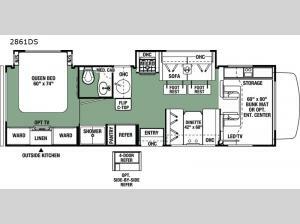 There is also space for an optional TV to watch movies at night before bed. The split bathroom has the shower opposite of the rest of the bathroom so you can use both at the same time. The sofa and dinette both have seatbelts for keeping your guests safe while you travel, and both of them fold down into a sleeping space at night if needed. There is also an outside kitchen for you to enjoy breakfast outdoors! Basement Storage 62.5 cu. ft.